The Allegiant World MasterCard currently has an Informr score of 7.5 out of 10. This score is based on our evaluation of 5 sources including reviews from users and the web's most trusted critics. Allegiant World MasterCard is typically available to those with good credit scores (650 or greater). 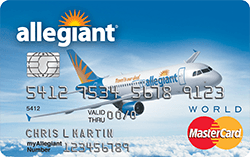 Allegiant World Mastercard isn’t the most generous airline credit card around, but it’s definitely a strong choice for frequent Allegiant Air travelers who like to make all their travel arrangements – hotel, rental car, airfare, attractions – in one place. You can get free companion airfare if the package includes at least four hotel nights or at least a seven-day car rental. While that seems very specific, it’s worth noting that Allegiant offers competitive pricing. If this works for you, the Allegiant card could end up saving you some serious money. Worth getting if you book trips with Allegiant and can use the buy one, get one free airfares at least once a year. However, if you want more redemption options and are willing to put in some effort to make sure you are getting a good rewards value, then you should consider other travel cards. The Allegiant World Mastercard is the only way for you to earn points toward travel through this no-frills, low-cost airline. If you’re looking for flexibility in redeeming your rewards, consider another travel card. It seems to have a pretty low annual fee at $59, but consequently, the list of benefits is also slightly less impressive than other competitors’ cards.